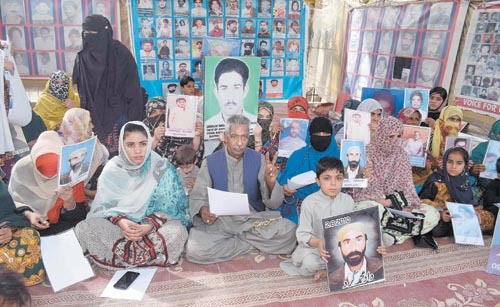 ISLAMABAD: Amnesty International has urged the government of Pakistan to take all measures to ensure an end to the practice of enforced disappearances that have long been a stain on the south Asian country’s ‘human rights record’.Despite the pledges of successive governments to criminalize the practice, there has been slow movement on legislation while people continue to go missing with impunity, as per a statement issued by Amnesty International. QUETTA: Apr01- Relatives of missing persons Abdul Wahid Kurd and Dad Muhammad Kurd protest in favor of their demands in front of press club. The UN Working Group on Enforced or Involuntary Disappearance has more than 700 cases pending from Pakistan.The number of cases of victims of enforced disappearance recorded by victim groups are much higher. 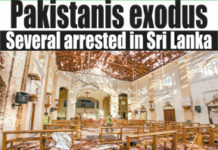 Victim groups and the civil society have serious concerns with regards to the effectiveness of Pakistan’s COIED, primarily because it is not using its powers to investigate and hold the perpetrators accountable and that it does not have civil society or the victim groups representation on its board. The government of new Prime Minister Imran Khan has said it is committed to criminalizing enforced disappearances. In January 2019, Pakistan’s Ministry of Human Rights submitted a draft bill to the Ministry of Law and Justice to criminalize enforced disappearances, through an amendment in the Pakistan Penal Code. Balochwarna News has claimed that Pakistani FC and military carried out offensives in different areas of district Kech and Panjgur Balochistan and abducted at least thirteen people in past less than 24 hours. According to details, Pakistan forces raids in Sangabad area of Tejaban village in Turbat and abducted at least nine people on Monday. The abductees have been named as Musa son Bujair, Rafiq son of Ahmad, Tawal son Zabad, Ameer Bakhsh son of Zabad, Wahag son of Musa, Gulab son of Musa, Pathan son of Musa, Bahot son of Miya and Faiz Mohammad son of Nawab. Earlier on Sunday, forces conducted offensive raids in Betap mountainous region between Mand and Kashaap region of Turbat Balochistan and abducted Umran son of Gajiyan and his cousin Samad son of Haji Peri and Yar Mohammad so of Khan Mohammad. 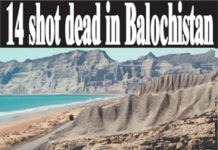 The victims are residents of Kashaap in Turbat Balochistan. Meanwhile, Free Balochistan Movement activists have held protest demonstrations and awareness campaigns in different countries including Canada, Germany, Austria, United States of America and the United Kingdom.